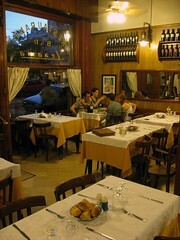 Parilla Lezama on Brasil Street offers typical dishes (cocina porteña). 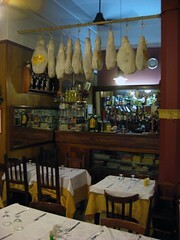 While the place we’d most recommend for steaks in San Telmo is Don Ernesto, Parilla Lezama is one of our favorite restaurants in the area. Since it’s a grill, you could order the parilla (grilled meats) which they’ll bring to the table on a small grill. A parilla at Lezama usually comes with a variety of beef cuts, some chicken and sausage. 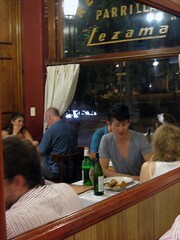 But Lezama’s speciality dishes are very tasty. Try the conejo al ajillo (rabbit with garlic), the matambrito de cerdo (pork flank steak), 1/2 pollo (boneless half of a chicken served with bacon, fries, and leek salad with grilled tomatoes), brochette de lomo (tenderloin skewers), cordero a la calabresa (lamb with potatoes), or the bondiola de cerdo (pork shoulder). And Lezama has a large selection of very traditional Argentine desserts: queso fresco y dulce (fresh cheese with jam), queso y batata (cheese with sweet potato jam), queso y membrillo (cheese with quince jam) zapallo (pumpkin), castañas (chestnuts), and higos (figs).